For the past several years, the rapid growth of the healthcare profession has been making headlines. From the shortage in nurses, the need for more physicians, and it being the number one recession-proof field – everyone seems to be talking about healthcare. The healthcare need is growing larger as the US population continues to live longer; including the large population increase of the baby boomers. While nurses and doctors grab the majority of the news stories, there exists a huge amount of need within the many professions that make up the massive healthcare infrastructure. The term “allied health” is used to describe more than 80 professions that work within and support healthcare. Including jobs like surgical technicians, physician’s assistants, diagnostic stenography (radiology and ultrasound), respiratory health, physical therapists, and more – the allied health field is wide and full of opportunities. With each profession mandating varying pay levels, educational requirements, and area of interest, allied health provides an attractive career path for millions. Typically, doctors and nurses are considered the face of healthcare, when in actuality they represent the minority percentage of workers in the field. A study conducted by the University of California, San Francisco found that allied health professional comprised 60% of the healthcare workforce. Healthcare is administered in three broad areas: hospitals, ambulatory (outpatient clinics), and nursing/residential care facilities. The UCSF study found that nearly half of California allied health workers provided care through ambulatory services. With advances in technology, more health care is being provided at the ambulatory level, as opposed to hospitals. By 2030 it is projected that hospital “days” will decrease from 4 days to 2.5 days, while visits to clinics is projected to increase from 3.2 visits to 4.2 visits. This increase in ambulatory visits translates to a greater demand for allied health professionals. Healthcare is a rapidly growing field, filled with shortages and high demand for employees. Research conducted by Georgetown University projects that the healthcare field will grow by 30%, to 5.6 million jobs, by 2020. Universities are not able to produce qualified students at this rate, creating a shortage. The high demand for allied health workers makes these jobs inherently stable, especially in the US’ uncertain economy. 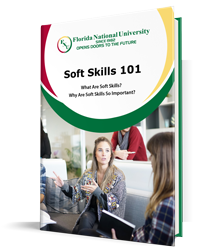 A regionally accredited and respected institution, Florida National University (FNU) offers a variety of degrees within the allied health field. Offering degrees through our entirely online program, as well as at our Florida campuses, FNU offers flexibility. Serving students from all around the world, FNU’s rigorous allied health degrees have allowed our alumni to find success in the desirable healthcare field. 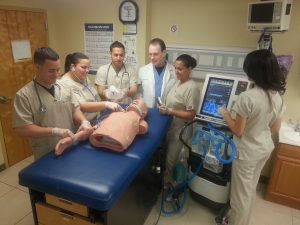 Join an exciting and rewarding allied health profession with a degree from Florida National University.